Take your loved ones to the unique indoor surf arena and learn how to tame the waves together with a special family offer for 2 grown-ups and 2 kids. Always wanted to try skydiving? Your whole family can experience it while staying safe thanks to the skydiving simulator. Check out special offers for bigger groups. Want to see Prague from above? Sign up for a family hot-air ballon flight. Want to get some fresh air? 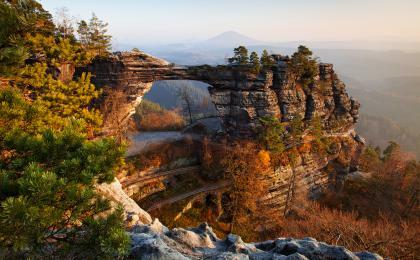 Join us for a day trip to one of the Czech national parks and enjoy some hiking out of Prague. The kids are sick of classical sightseeing on foot? A river cruise on the Vltava river with our cute wooden historic boat may be just the way to show them the sights without their little feet getting sore. It takes 45 minutes - about enough to keep them excited. The Petřín hill has many attractions that kids simply love. Ride up the hill using the Petřín funicular (standard public transport tickets apply) and climb the Petřín observation tower to have the best view of the city. Below the tower you can visit a mirror maze and the Battle of Lipany panorama built in the 19th century, when these kinds of attractions where popular. Petřín is also the favorite place for lovers who gather at the statue of poet Karel Hynek Mácha on the 1st May and then kiss under blossoming cherry trees. Want to teach your kids something about art, but you know that visiting a classical gallery isn´t a good idea? Visit the Rudolfinum Artpark located in the famous concert and gallery building just a short walk from Old Town Square through Kaprova street. Modern art and artist are presented here through games, interactive boards, touchscreens and workshops for kids. Explore a natural oasis in the city centre - the Franciscan garden. Benches, hedges, statues, fountains and a nice playground will let you blow off steam after all that necessary sightseeing. Have an icecream and “chlebíček” (small open-face sandwich that Czechs adore) at the popular Světozor bistro at the nearby shopping arcade or treat yourself to a cold glass of Pilsen beer at the adjoined pub “U Pinkasů” with a gothic cooling system. This lovely island to the left from the National Theatre offers a nice park with a playground, train track for kids and lovely views of the Vltava river and the Hradčany panorama. Have a drink and snack at one of the floating bistros, where you can also rent a paddleboat. Paddle around the island, under Vltava´s bridges and don't forget to wear sunscreen. The closest lido to the city centre is Žluté lázně - 4 stops by tram from the National Theatre. A sand beach, volleyball courses, restaurants and swimming right in the Vltava river is just a taste of all the activities offered there. The water is super cold there, so you may prefer to visit the Podolí swimming pools (indoor and outdoor + water attractions) instead - they are just across the street. Check out our special article about swimming opportunities in Prague. The Prague ZOO is a true delight for a family trip. Take the bus from the metro station Nádraží Holešovice and step into one of the most highly ranked ZOOs in the world. Walk through the vast zoo grounds on foot or ride a funicular that will take you to the upper part of the ZOO. An African safari, an Indonesian jungle or a farm-like petting zoo - that´s just a taste of the huge collection of exotic and domestic animals that found their home in Prague. Looking for other family adventures? Take your loved ones to the unique indoor surf arena and learn how to tame the waves together with a special family offer for 2 grown-ups and 2 kids. Always wanted to try skydiving? Your whole family can experience it while staying safe thanks to the skydiving simulator. Want to see Prague from above? Sign up for a family hot-air ballon flight for 2 adults and 2 kids. Team up with ActiveCzech.com and have a family vacation full of great memories.